As reported by the Interfax news agency on February 26, 2019, the Ministry of Defense of the Russian Federation was awarded all upgraded Su-27SM fighters under the contract (3). This was announced by the director of the branch of PJSC "Company" Sukhoi "Komsomolsk-on-Amur Aviation Plant named after Yury Gagarin (KnAAZ) Alexander Pekarsh. "And last year they completed the production of the last contract for the supply of 10 aircraft. We delivered four planes in 2017, and six planes in 2018," said A. Pekars to journalists on Tuesday. "It gave new qualities to the machines that we supplied in the late 1980s - early 1990s, up to 80 percent of the equipment changes," he noted. From the side of bmpd, we recall that the Su-27SM(3) is the most advanced serial version of the modernization of the Su-27 fighter jets, adopted by the Air Force/VKS of Russia. Two prototypes of the Su-27SM(3) were upgraded at KnAAPO (KnAAZ) in 2008-2010 to conduct tests of the previously upgraded Su-27SM fighter jets (serial numbers 38001 and 38002). In August 2009, during the MAKS-2009 air show, the Sukhoi Company entered into a contract to supply the Russian Ministry of Defense with 12 fighter aircraft built in the guise of the Su-27SM(3) built at KnAAZ in 2010-2011 (the planes were completed from People's Republic of China kits of Su-27SK fighters). All these 12 Su-27SM(3) aircraft with red tail numbers from "51" to "62" entered the 1st aviation group of the 6972th aviation base at the Krymsk airfield (Krasnodar Territory), from December 1, 2013 the air group was reorganized into the 3rd mixed aviation regiment of the 1st mixed aviation division of the 4th Army Air Force and Air Defense of the Southern Military District (later the Su-27SM(3) regiment with the tail number 60 changed its number to 65 red). Then, the Russian Aerospace Forces attempted to implement a modernization program for the Su-27SM(3) variant of the Su-27 combat fighter jet fleet. In August 2012, two Su-27P fighters (serial numbers 36309 and 36411) arrived at KnAAZ for pilot modernization, which were completed to the level of Su-27SM(3) by early 2014. In May 2014, both of these fighters (which received the red side numbers "63" and "64") also entered the 3rd mixed aviation regiment in Krymsk. It was reported that the results of the operation of these "pilot" modernized airplanes 36309 and 36411 "were generally positively evaluated", and on April 16, 2015, Sukhoi reached a preliminary agreement with the Russian Ministry of Defense on the modernization of 36 Su-27S(P) combatant fighters in the variant Su-27SM(3) in the period 2016-2020. At the same time, the assigned resource (after modernization) of the aircraft being modernized was to be 2000 hours, and the calendar resource (from the date of production) was to be 30 years with a phased extension to 40 years. However, in fact, a firm contract, as is now known, was concluded for the modernization of only ten fighters to the level of the Su-27SM(3). 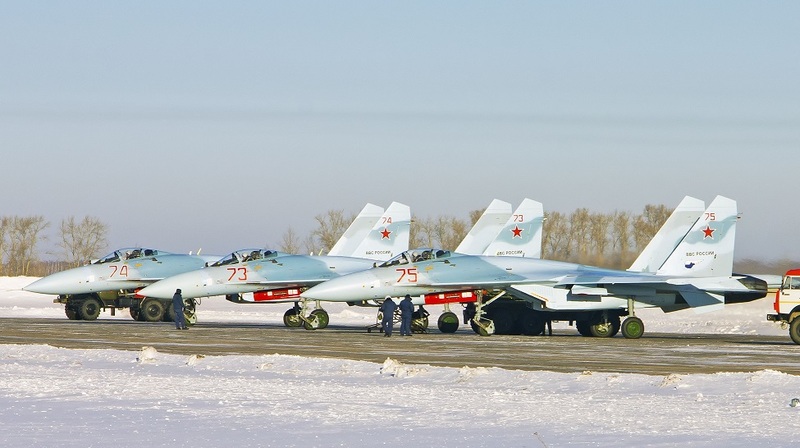 As part of the implementation of this contract, in May 2015, four Su-27S fighters from the same 3rd Mixed Aviation Regiment (serial numbers 34102, 36412, 36413 and 36514) were delivered to KnAAZ for modernization (six more fighter jets) 27 (serial numbers 33103, 33205, 33206, 33309, 33411 and 33513) for upgrading were later transported to KnAAZ from storage. Modernization of the four first sides of the 3rd Regiment (the indicated estimated serial numbers 34102, 36412, 36514 and 36413) stretched over two and a half years and was completed only by the end of 2017. As a result, only in December 2017 KnAAZ delivered the first four upgraded Su-27SM(3) fighters. The first two Su-27SM(3) aircraft with red side numbers "68" and "69" (serial numbers 36514 and 36413) - flew from Komsomolsk-on-Amur to Krymsk on December 28, 2017, and the other two with red side numbers "67" and "72" (serial numbers 34102 and 36412) - flew to Krymsk in January 2018. The next three Su-27SM(3) fighters that completed the modernization, having red side numbers "76", "77" and "78", were transferred to KnAAZ in Krymsk on October 30, 2018, and the last three (red side numbers "73", " 74 "and" 75 ") flew to Krymsk on December 26, 2018. Thus, now the 3rd mixed aviation regiment has two squadrons of Su-27SM(3) fighters (24 aircraft — 12 new and 12 modernized ones). Actually watching that video it is rather interesting. Looks like Russia got its hands on some klingon tech. That is a pretty interesting comparison. To be fair though the Su-27 is below horizon with clouds behind while the F-15 is silhouetted above the horizon. Also for the record: the F-15 wasn't merely 'patrolling' as claimed there, it was armed and intercepting probably a Russian diplomatic flight in 2018 (some suggest 2017). Video is taken from intercepted plane. Its at least very bad manners to intercept diplomatic flights by openly armed planes & is definitely drifting excessively close so the F-15 was the one out-of-order -> the armed Su-27 aggressively forcing it away. Imagine what would happen if an armed Russian plane got that close to Airforce1? Similar thing happened in 2017 when a diplomatic plane carrying Shoigu was intercepted by an armed F-16.